This property offers an excellent timber investment opportunity as well as a prime hunting spot. It is situated in an agricultural area that provides a great food source for deer and wild turkey. It is close to town with quick and easy access to good restaurants and supplies. The Montgomery 420 tract contains approximately 414.3 acres as illustrated on the maps above and is taxed at 417 acres. 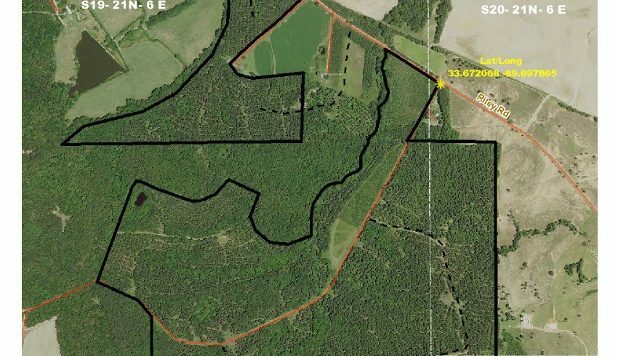 It is 95 percent forested with the exception of about 22 acres in roads, wildlife food plots, loading decks and kudzu. The tract is located in northwest Montgomery County along the Grenada County line. It is two miles north of Duck Hill and nine miles southeast of Grenada. The property is located in an area that contains a good mix of cropland, pasture, timberland, and rural residences. It is also close to Camp McCain, which is a training center for the Mississippi National Guard. The tract has limited but adequate access along Riley Road, which is gravel. The property actually consists of two separate parcels that are about one-quarter miles apart (see Maps). Both tracts have public road frontage on Riley Road. The larger parcel has excellent interior access provided by an all-weather woods road. About 70 percent of Montgomery 420 supports merchantable loblolly pine plantations ranging from 16 to 25 years old. Half of these plantations were established on highly fertile former cropland through the USDA Conservation Reserve Program (CRP). However, none of these acres are still enrolled in CRP. Stand 1 contains 145 acres of 25-year-old pine plantation established on cutover land. These plantations were all thinned about five years ago and are in excellent shape (see Stand Map). There are about 14 acres of pre-merchantable six-year-old loblolly plantation established on cropland. The remainder of the forested acres support natural stands of timber. A large creek forms the west boundary of the smaller parcel. There is a 2.4-acre kudzu patch at the northwest corner of this parcel adjacent to the creek and Riley Road. The Montgomery 420 tract is considered highly desirable due to the productive soils, good interior road, high percentage of pine plantation, and nearness to wood-using mills. The tract is also close to Grenada, Mississippi, which is a fairly good-sized Mississippi town (population 13,092). The topography of Montgomery 420 ranges from nearly level bottomland on the west 60 percent of the tract and transitions to rolling on the eastern portion. Total elevation change is 70 feet and ranges from 270 to 340 feet above sea level. A large creek forms the west boundary line of the smaller parcel. A fairly large drain also runs north through the center of the larger parcel. A small pond is located near the northwest corner of the larger parcel. The tract is situated in Sections 19, 20, 29, and 30, Township 21 North, Range 6 East, Montgomery County, Mississippi. The Tax assessor lists acres at 417. The property fronts Riley Road. The street address is 597 Riley Road, Duck Hill, MS 38935. The lat/long to the entrance to the main block is 33.672068, -89.697865 The combination to the gate is 4006.